, an English physician, and founder of the Humane Society, was born at Islington, Nov. 28,1736; and received the early part of his education in his native village, and completed it in St. Paul’s school. 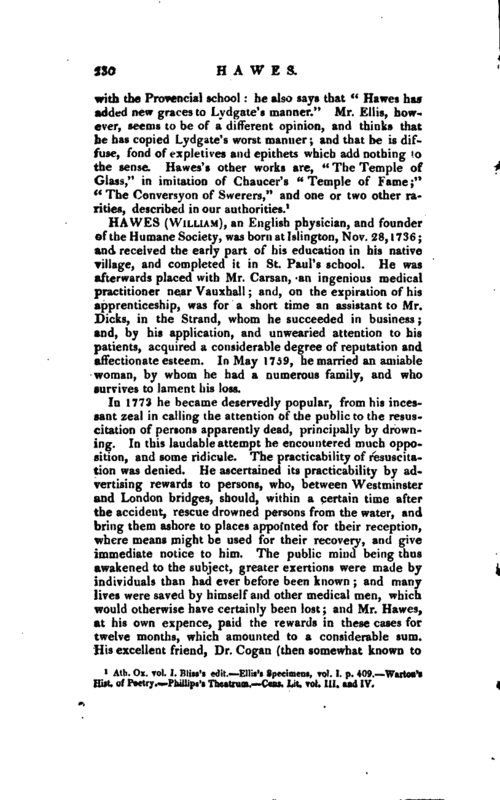 He was afterwards placed with Mr. Carsan, an ingenious medical practitioner near Vauxhall; and, on the expiration of his apprenticeship, was for a short time an assistant to Mr. Dicks, in the Strand, whom he succeeded in business; and, by his application, and unwearied attention to his patients, acquired a considerable degree of reputation and affectionate esteem. In May 1759, he married an amiable woman, by whom he had a numerous family, and who survives to lament his loss. In 1773 he became deservedly popular, from his incessant zeal in calling the attention of the public to the resuscitation of persons apparently dead, principally by drowning. In this laudable attempt he encountered much opposition, and some ridicule. The practicability of resuscitation was denied. He ascertained its practicability by advertising rewards to persons, who, between Westminster and London bridges, should, within a certain time after the accident, rescue drowned persons from the water, and bring them ashore to places appointed for their reception, where means might be used for their recovery, and give immediate notice to him. 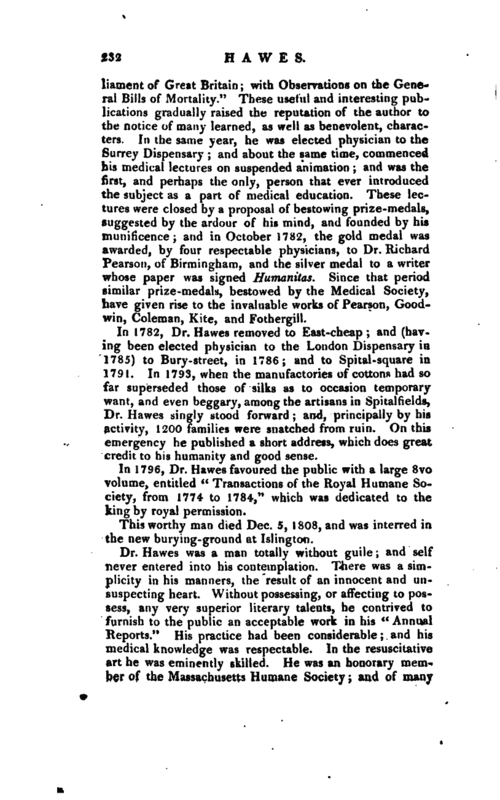 The public mind being thus awakened to the subject, greater exertions were made by individuals than had ever before been known; and many lives were saved by himself and other medical men, which would otherwise have certainly been lost; and Mr. Hawes, at his own expence, paid the rewards in these cases for twelve months, which amounted to a considerable sum. 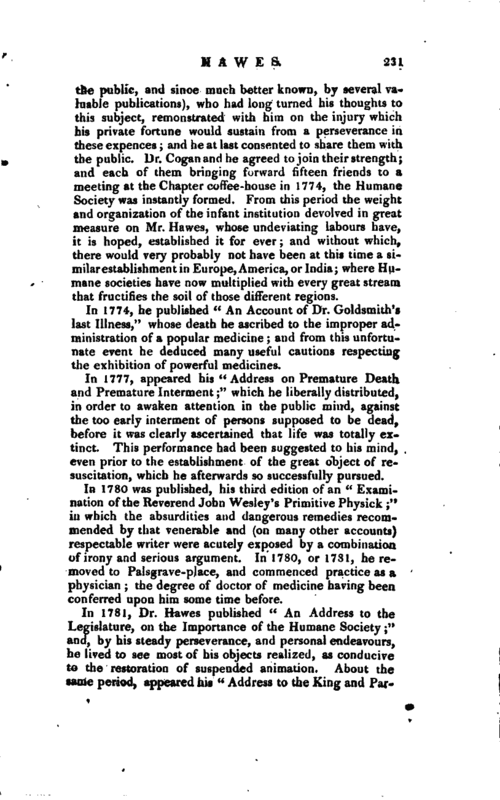 His excellent friend, Dr. Cogan (then somewhat known to | the public, and since much better known, by several valuable publications), who had long turned his thoughts to this subject, remonstrated with him on the injury which his private fortune would sustain from a perseverancein these expences and he at last consented to share them with the public. Dr. Coganancl he agreed to join their strength; and each of them bringing forward fifteen friends to a meeting at the Chapter coftee-house in 1774, the Humane Society was instantly formed. From this period the weight and organization of the infant institution devolved in great measure on Mr. Hawes, whose undeviating labours have, it is hoped, established it for ever; and without which, there would very probably not have been at this time a similar establishment in Europe, America, or India; where Humane societies have now multiplied with every great stream that fructifies the soil of those different regions. In 1774, he published “An Account of Dr. Goldsmith’s last Illness,” whose death he ascribed to the improper administration of a popular medicine; and from this unfortunate event he deduced many useful cautions respecting the exhibition of powerful medicines. In 1777, appeared his “Address on Premature Death and Premature Interment;” which he liberally distributed, in order to awaken attention in the public mind, against the too early interment of persons supposed to be dead, before it was clearly ascertained that life was totally extinct. This performance had been suggested to his mind, even prior to the establishment of the great object of resuscitation, which he afterwards so successfully pursued. In 1780 was published, his third edition of an “Examination of the Reverend John Wesley’s Primitive Physick;” in which the absurdities and dangerous remedies recommended by that venerable and (on many other accounts) respectable writer were acutely exposed by a combination of irony and serious argument. In 1780, or 1731, he removed to Palsgrave-place, and commenced practice as a physician; the degree of doctor of medicine having been conferred upon him some time before. In 1781, Dr. Hawes published “An Address to the Legislature, on the Importance of the Humane Society;” and, by his steady perseverance, and personal endeavours, he lived to see most of his objects realized, as conducive to the restoration of suspended animation. About the same period, appeared his “Address to the King and | Parliament of Great Britain; with Observations on the General Bills of Mortality.” These useful and interesting publications gradually raised the reputation of the author to the notice of many learned, as well as benevolent, characters. In the same year, he was elected physician to the Surrey Dispensary and about the same time, commenced his medical lectures on suspended animation and was the first, and perhaps the only, person that ever introduced the subject as a part of medical education. These lectures were closed by a proposal of bestowing prize-medals, suggested by the ardour of his mind, and founded by his munificence; and in October 1782, the gold medal was awarded, by four respectable physicians, to Dr. Richard Pearson, of Birmingham, and the silver medal to a writer whose paper wat signed Humanitas. Since that period similar prize-medals, bestowed by the Medical Society, have given rise to the invaluable works of Pearson, Goodwin, Coleman, Kite, and Fothergill. In 1782, Dr. Hawes removed to East-cheap; and (having been elected physician to the London Dispensary in 1785) to Bury-street, in 1786; and to Spital-square in 1791. In 1793, when the manufactories of cottons had so far superseded those of silks as to occasion temporary want, and even beggary, among the artisans in Spitalfields, Dr. Hawes singly stood forward; and, principally by his activity, 1200 families were snatched from ruin. On this emergency he published a short address, which does great credit to his humanity and good sense. 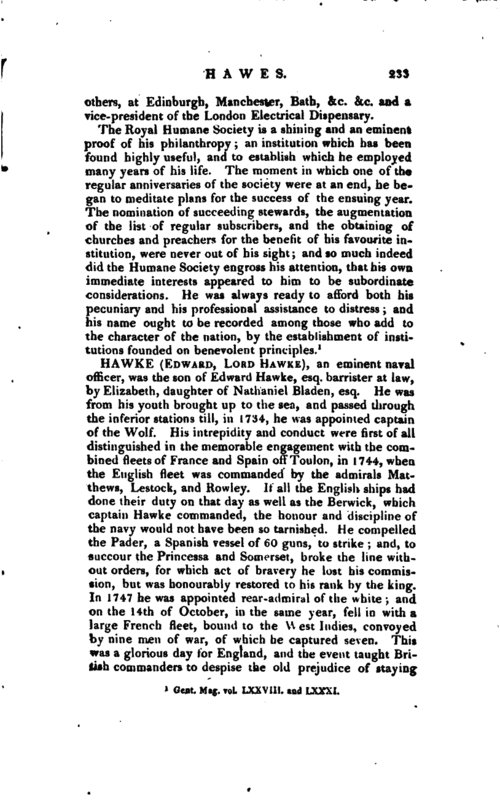 In 1796, Dr. Hawes favoured the public with a large 8vo volume, entitled “Transactions of the Royal Humane Society, from 1774 to 1784,” which was dedicated to the king by royal permission. This worthy man died Dec. 5, 1808, and was interred in the new burying-ground at Islington. Dr. Hawes was a man totally without guile; and self never entered into his contemplation. There was a simplicity in his manners, the result of an innocent and unsuspecting heart. Without possessing, or affecting to possess, any very superior literary talents, he contrived to furnish to the public an acceptable work in his “Annual Reports.” His practice had been considerable; and his medical knowledge was respectable. In the resuscitative part he was eminently skilled. He was an honorary member of the Massachusetts Humane Society; and of many | others, at Edinburgh, Manchester, Bath, &c. &c. and a vice-president of the London Electrical Dispensary. Gent. Mag. vol. LXXVIII. and LXXXI.